OCT 19 (WTN) - If you look at the last five assembly elections in Madhya Pradesh, it is clear that the voters here believe in a single party and give them full majority. 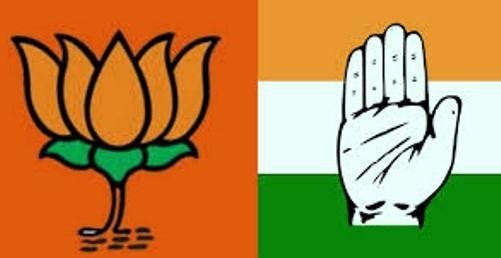 In 1993 and 1998 assembly election, Congress got full majority, whereas the BJP formed the government on its own in the 2003, 2008 and 2013 elections. But do you know the difference of vote percent in loss and victory between these two parties? If you do not know, then we describe you that the difference between the percentage of votes between BJP and Congress in the last five assembly elections and based on vote percentage, how much the difference in the seats was. Let's talk first of the 1993 assembly elections. In this year's election, the BJP had contested in all the 320 seats in the election and won 117 seats with 38.82 per cent votes. At the same time, Congress contested in 318 seats and won 174 seats with 40.67 per cent votes. If we see the differences between the two parties on votes and seats, then the Congress got only 1.85 percent of the more votes than the BJP, but it got 57 seats more than the BJP. In the 1998 assembly elections, the BJP contested in all 320 seats and won only 119 seats. BJP got 39.28 per cent of the votes in this election. At the same time Congress contested in 316 seats in this election and succeeded in winning 172 of its candidates. Congress got 40.59 per cent of the votes in this election. If we see the difference, then the Congress got only 1.31 percent more votes than the BJP, but it managed to win 53 seats more. In the elections of 2003, the BJP defeated the Congress and ended its ten-year rule. At the time of this election, the Chhattisgarh state had separated from Madhya Pradesh and the number of seats in Madhya Pradesh had decreased from 320 to 230. The BJP contested IN all the 230 seats in the state and with 42.50 percent votes, it could win record 173 seats. The Congress lost badly in this election. In these elections, the Congress got only 31.61 percent of the votes and it could win only in 38 seats. If we see the difference, then the BJP got 10.89 per cent more votes than the Congress, on which the BJP got 135 seats more than the Congress. Congress also suffered defeat in the 2008 assembly elections. In this election, the BJP contested in 228 seats and won 143 seats with 37.64 vote per cent. Talk to Congress, so Congress also contested in 228 seats and won only on 71 seats. In this election Congress could get 32.39 per cent of the votes. In the 2008 assembly elections, the BJP got more than 5.25 per cent of the vote than the Congress and on this basis BJP got more than 72 seats to Congress.